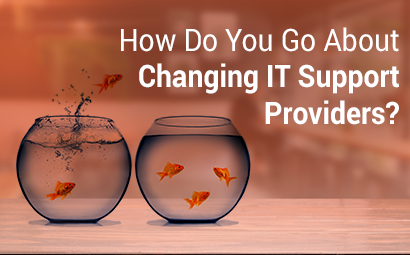 Changing IT companies is a big decision to make for your business and one that requires lots of thought and preparation. You want the transition to go smoothly and to cause minimal disruption to your staff and customers. We’ve put together some information to help you get ready to make that change. This is a proactive approach and one which ATG favours. It’s designed to understand what you need from a supplier, instead of just giving support and being reactive to problems. We gather all of the above information from every new client we take on, which makes us less of a supplier and more of an active partner in your business. You know you can rely on us. You may need to give notice three months in advance of your renewal date, and many companies operate on rolling contracts, which can prevent you from changing IT support provider outside of the agreed timeframe, so give yourself and the new provider plenty of time to get things in place (we recommend six months). ‘Onboarding’ is the process of bringing a new client into the business, understanding their needs, dealing with queries and issues and making sure systems are integrated and up and running. Many IT companies will attend a meeting with a potential client, tell them they can help, ask them to sign a contract and start the support straight away. However, at ATG we don’t believe you can support someone else’s business unless you fully understand them, and that’s why we start collecting information well in advance. Our onboarding process lasts around a month or two and runs in tandem with the existing IT services company’s final month of support. We carry out audits and start to put our own systems in place, which is different to what most of the industry does. This makes the transition seamless and you don’t have to worry about anything. Changing support services shouldn’t happen overnight. By taking the time to get to know your business and getting our software in place, as soon as we reach your contract start date, we’re able to support you fully. Offboarding, of course, is the process your existing IT support company will be going through to remove all of your business data from their systems and getting it all ready to hand over to us. We liaise with the incumbent provider on behalf of all of our new customers, to make sure there’s no friction. One of the reasons ATG takes so much time on information-gathering and visiting a company is that the business owner may think they’re using technology in one way, but the users are using it in a completely different way. We like to take time to interview key members of staff to find out how they use the technology so we understand how they work. We also produce reports on how they can use it to be more efficient, as well as highlighting any potential security problems. For more information on what to look for in an IT support service company, click here to download our handy IT Checklist.